One of the most enjoyable aspects of a holiday afloat is the feeling of freedom – freedom to go exactly where you want at your own pace, with everything close at hand. However, in order for housekeeping to go smoothly, it is helpful to know some of the ways in which life on board is different from that ashore. Every boat has their own water hose. Please always ensure that when filling up your water tank the hose pipe is rinsed through prior to inserting into the tank, and that care is taken not to allow the end of the hose to drag along the ground or fall into the waterway. Do not use a drinking water hose for any other purpose than filling up your boats water tanks. Please remember to take all your water hose fittings with you after filling up. Do not allow your pet to foul any ground with which the drinking hose might come into contact. n.b. The water tanks and hose on this boat are periodically sterilized, however, as we are unable to guarantee that the procedures laid out in the manual have been followed by previous crews, strictly speaking, tap water on this boat should be boiled before consumption. Unlike mains electricity the supply on board is not limitless, and if you use power without running the engine you will flatten the battery. You should cruise for a minimum three or four hours every day to keep your battery charged, and, if you are mooring in one place for more than 24 hours you will need to run the engine for the same time to replenish the batteries. (Avoid doing so between 7pm and 7am to limit disturbance to others). Limit use where possible, and use lights sparingly, particularly in early spring and late autumn. Most boats have an electric refrigerator or a cold food cabinet. However, boat refrigerators, for a number of reasons, are not as efficient as the normal domestic models. We therefore recommend that you do not store frozen foods in the refrigerator nor attempt to store enough food for more than two days. The hot water in most boats is heated by a calorifier utilising heat from the engine, and is much hotter than domestic hot water. Both hot and cold water are supplied by a pump which is automatically controlled by the pressure in the system. The master switch for this system should be switched off each night. Refill water tanks whenever possible and do not allow the water tanks to run dry because if they do, the pump will run continually. If the tanks do run dry, the switch must be turned to off so that the pump does not burn out. NB some yachts from West Highland Sailing have only cold water. Some boats are fitted with showers, and the water from these is either pumped or drained overboard. 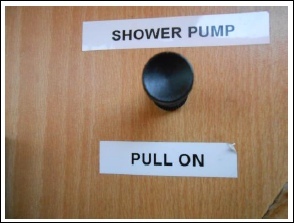 The switch from the pump is positioned on the wall of the shower. Some yachts utilise the bilge pump for the shower water and some have a direct waste overboard – please check which system you have with us. Keep the shower tray clean to prevent clogging the outlet to the pump, and remember to switch off when finished, as continual dry running will burn the pump out. Keep the lid down when not in use. Nappies, sanitary towels of all kinds, wet wipes, any foreign objects and wads of toilet paper must be disposed of ashore. If the toilet becomes blocked through misuse, you will have to pay for its clearance. Do not dispose of cooking fat or any other waste food down the sinks. Your gas cooker works in the same way as a household cooker with the supply coming from a cylinder located in a vented locker. Your boat will normally be equipped with two cylinders. There should be enough for your holiday but, if necessary, replacement cylinders may be obtained through your boatyard. Danger– Cooking gas is heavier than air, and even a small leak may accumulate in the bottom of the boat, with potentially catastrophic consequences. Although incidents of this nature are extremely rare, risk may be virtually eliminated by following the procedures set out below. Each burner is fitted with a flame failure device. In order to turn a burner on it is necessary to push in the control knob and keep it pushed in for a few seconds after the burner is lit. When lighting a burner, strike the match /lighter first, then turn it on and light it immediately. Even though the cooker has flame failure devices, never leave your cooker unattended when on. Be aware that strong draughts, liquids boiling over, and slamming the oven door, may extinguish the flame. If you think that the oven has gone out, turn off the other burners before you open the door. Do not take any portable gas appliances, such as heaters or barbeques on board. Turn off the gas cylinder when not in use. Clockwise is off. 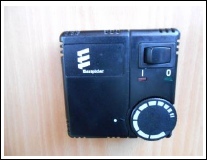 Before turning your gas cylinder on, check that the gas alarm is active i.e. the red LED indicators on the control box are on. If you suspect a leak, turn off the gas at the cylinder immediately. Do not switch anything on or off, open all doors windows and hatches. If alongside evacuate the boat and move to a safe distance. Contact the boatyard. The gas alarm is fitted as an additional precaution. The alarm is extremely sensitive and may occasionally be activated from other sources e.g. oil fumes. Generally, this tends to happen in the early hours of the morning. If you are certain that the gas had been properly isolated previously, at the gas cylinder, you may reset the alarm by switching it off and then on again using the LED rocker switch. It is important to ensure you always have good ventilation. The fixed ventilators on your boat are designed to allow sufficient air to be circulated for the normal maximum number of people aboard. Whenever you are staying in, or you have invited friends aboard, make sure that there are sufficient windows open to give adequate ventilation. NB No more people than the maximum number of persons shown on page 1 of this manual may be accommodated on board. All heaters are diesel fired warm air and should be turned off whenever your boat is unattended, and before you go to bed at night. There are at least two fire extinguishers (and a fire blanket) on board your boat in case of an emergency. Make sure that everyone knows where they are and how to use them. In the event of a serious emergency requiring police, fire or ambulance services, dial 999 and then contact your home boatyard. If you wish to bring your pet on board, in the interest of hygiene do not allow it on seats and bedding. Please keep pets well under control at all times. Please keep your boat as clean and tidy as possible. Keep the interior and the utensils clean, and use the mop to wash down the exterior of the boat. Do not wash down the exterior whilst under way. Do take what valuable items you can with you and leave as little as possible on board. Do find a suitable hiding place for your cameras, watches, binoculars and radios etc. Do make sure you can identify your property. Don’t leave your valuables on view on tables or in the cockpit. In the unlikely event that you do encounter any trouble or see anything suspicious, do not hesitate to contact the local police. Please ensure that boats are returned to base by 9am, failure to do so will incur a late check out charge. Check all personal items are off the boat. Remove any rubbish and place in the bins which are located across the locks. Leave keys in the ignition and boat unlocked. Please return all lifejackets to shed. Boats left in a dirty condition will incur a cleaning charge of £65.